Who says Membership Software can't be reasonably priced? Whether you have an organization of a few hundred members, or many thousands, MemberTies gives you everything you need. Track contact information, dues, and donations, send integrated email, run reports, and manage events and activities. Keep your database on your own computer, or have it hosted on our servers so you can access it from anywhere. Networkable, multi-user, powerful, and flexible, with outstanding customer support. 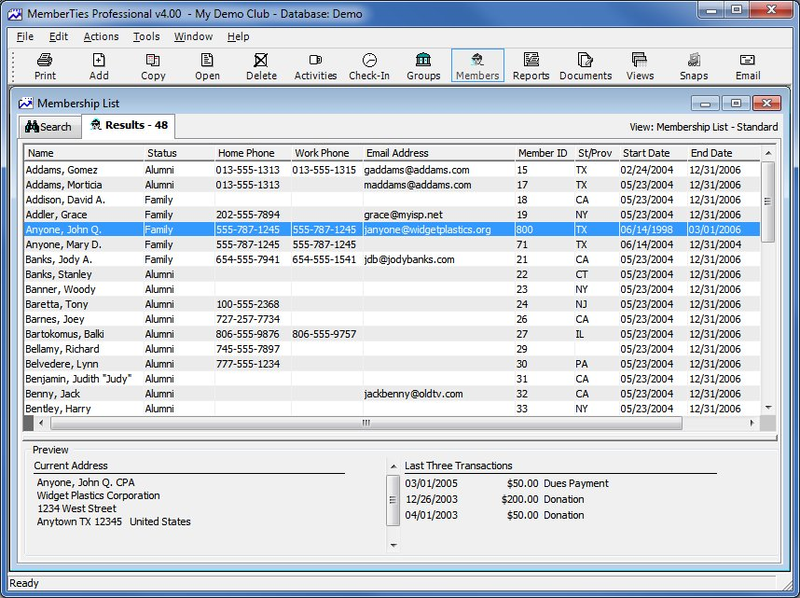 Pros: MemberTies Pro is a powerful, flexible, scalable solution for tracking membership matters. It has really assisted me, as Membership Chair, in doing my job properly and efficiently. I can track things that were difficult or impossible to follow previously, which allows me to nip problems in the bud before they fester and cause upset and bruised egos; thus helping to make the Association run smoothly. I can, with a little thought, search out any group of members I need with an easy and straightforward search protocol that's simple and intuitive to use. I can teach others to handle the software in its essentials in very short order for when I'm gone. It's a great product; better than any other I've seen or experienced. Cons: I'm hard put to come up with something that I don't like about the software. I've made a couple of suggestions for new features along the way, and the support people at MemberTies have incorporated them into their routine update releases. I was very surprised when that happened. I've never had a support person make changes to increase the capability of their software short of a whole new version for a whole new price. But the MemberTies people have done just that. I guess if pressed, I'd say that I'd appreciate a way to (obviously) mark files in multiple ways so that I can keep certain files separated from the rest at a glance, rather than having to open the file to verify that it contains what I want (or don't want). But this is a minor issue for me really. Overall: As a Sportsmen's Association with more than 1700 members, discerning and understanding the consensus of membership desires is challenging. Surveys help, but tend to be skewed. With MemberTies Pro we can track what our members are doing, rather than what they say they're doing. The resulting data allows us to dedicate assets where the Association will gain the most benefit from the expenditure. We know our members better, and thus can serve them better. Also, a word about MemberTies support: Absolutely fantastic. I have dealt with lots of different software packages in my day (many unrelated to MBT subject matter) and I have dealt with good support people before, but nobody has EVER equaled MemberTies Customer Support quality. Their responsiveness is unparalleled -- I have always had a response in 24 hours or less; often just an hour or so (unless I write outside reasonable business hours). Their diligence in tracking down a problem I had was impressive, and we worked together to get things resolved and back on track. They were also extremely helpful when I needed to make changes to our database (due to poor original decision-making in our organization); the MemberTies people listened to what I needed, made the fix perfectly, and got my revised database back to me in 24 hours. I can't say enough great things about MemberTies support. They're absolutely top drawer. Thank you for your feedback! As far as marking certain records... it may be possible to create a custom field with a checkbox or whatever, and then add that field to the default view (the membership list) so it is always displayed without needing to open the record. Cons: Can not get support from them. I purchased a renewal but I can not get them to send me the new key for the software even though I paid for it. When I chat online with them they just say they will cancel order. This is not the way business should be done. Love the program but no longer trust them. Overall: Program works great but now I do not trust them. Unfortunately, all email sent to this customer bounced. When the customer contacted us via our chat app, we tried to explain this, but he got angry and said we were lying because he can receive email from other people, despite the obvious fact that we have a folder full of bounced email errors. Then he said he wanted a refund and would be calling his credit card company to cancel the charge. We said we could do that, and started to ask for an alternative email address, but he abruptly disconnected. We refunded his charge immediately. Then he continued to send us angry emails demanding his license. Eventually he sent an email from another account under a totally different name, probably by accident, and received our reply to that, where we again explained that his purchase had been refunded as requested. We know that email was received because he replied to it with yet another angry, email. So hopefully he realizes the bounce issue was true. Pros: Software is quite easy to follow and use. Reports are very valuable and to an extent customizable to what I need. Cons: When members drop off, the database cannot be compacted to reuse open numbers. The timing on renewal and drop status had some bugs in it that will put members in drop status when they are not. Overall: Overall, I'm happy with the program. I would like to see the ability for a network based DB and multiple PC's log into it at same time. Email features are wonderful. Set up a template and run them when needed. The program is robust enough to do what I need but still small enough to run on a basic laptop. Automatic status changes should only happen when a status is set to automatically change to a new status on the expiry date (plus any grace period). So be sure to verify settings on your statuses if someone changes status unexpectedly. Pros: Is comprehensive. Keeps track of a lot of things and makes good reports. Cons: The city fill is annoying. "The value "-" is not in the city list. Do you want to add it?" That's a waste of time. Of course I want to add it. Zip codes ought to be autofilled. It should remember the zip code you entered the first time for a city and remember it. When doing report sorting, things like specifying the date are cumbersome and require too many clicks. The reason the City field prompts you to see if you want to add it when you type something new is because without the prompt, a typo would cause a new city entry to be created when you really meant it to be the same. Then you can't search for everyone in a particular city any more, because there are unintended variations. Fortunately, if you do intend to add the new city, just pressing Enter will dismiss the popup and add it to the list, so it's one extra keypress. A ZIP code auto-fill is something we are considering, but there are many cities with multiple ZIP codes associated with them, so it gets a little tricky. Pros: We have been using Member Ties since 2005. It was easy to use and to train our Front Desk Staff. Once we started using this software to check in members, our guest fees increased by over $5K. Cons: When we started, they did not have the Friends/Family tab so we had to use Associated and had to create a new record with a new member number for each family member. We also wish we could take the photo for the member directly from within Member Ties. It is an extra step to take the photo and then associate with the member. Overall: Fantastic customer service. Even if we had issues over the weekend, we could always get someone to help. Great product and great value. If you would like to convert an existing Associated record to a Friend/Family record, there is a right-click option to do that. Just right-click the associated name, and choose "Convert to Friends/Family". If you need to do that with a large number of records, contact support and we can help do it in bulk. Pros: MemberTies does what it says on the tin. Cons: The one thing you have to be aware of is that this is a Membership application with email functionality not a email application with membership functionality. Sending emails to members can be a bit of a "fiddle" bur it does the job. Pros: It's ability to manage a database for membership communication such as letters, e-mail and more is outstanding. Cons: I have a hard time with the word processing function. I can print reports fine direct to my printer, but must print documents to a pdf file then reprint from outside Member Ties. Overall: Member Ties makes membership renewal a breeze. I print letters a month ahead of time and as they are returned, I can process and see who needs a reminder. Thank you for your feedback. The only reason I can think of that documents would not print would be a printer driver issue. If you have a particularly old printer that doesn't support unicode, for example, it may not be able to print to it. Pros: Ease of use. Home screen has all the most needed information right at fingertips. Wide variety of options. Cons: Inability to create reports easily. Options of reports not easily to modify. Been using ten years and still have trouble creating or retrieving certain information. Overall: Our senior center has over 1000 members. Easy to record members and keep track of birthdays etc. Sorry you're having trouble creating user-defined reports. Please contact support when you're stuck and we'll be happy to help walk you through it. The user-defined reports are pretty powerful, and thus have a lot of options. Let us know what we can explain better! Pros: Simple and easy to use features with a great help section. Cons: In a world of glitzy, easy to use interfaces, Member Ties appears to be less user friendly and more technical. Overall: Overall, we've had great success with Member Ties. It does what we need it do, and we use it simply. Thanks for your feedback! That "older" look and feel of the program is one of the reasons we're in the middle of a massive rewrite. We want to update the user interface to be more modern, and more intuitive to ensure that it continues to perform as Windows versions continue to change. There have been a lot of changes over the past 20 years, but it has meant the interface has become dated. Pros: i've used all kinds of software applications since 1976. MemberTies is one of the best i've ever used - incredibly easy to use w/ neat little nifty ways of doing things. and when not exactly easy, the Help files wake me thru the steps. excellent software with fast and very helpful handling of questions/problems. Cons: wish one could customize the tool bar (add/remove function icons) so my most used functions were quickly available instead of having to go thru the menu system. Overall: MT helps me keep track of our membership, dues payments, and other customized info. The reporting features in the Pro version are top-notch!! while the pre-defined reports are good, the ability to create user-defined reports is the BEST!!! i use them to generate a list of members w/ email addrs, w/ phone#, w/ full contact info, w/ reports of custom fields, info for mailing labels, etc. MT has saved me lots of time in managing our membership. Pros: It is very easy to use for all general activities. Easy to add users. Gives you many categorizes to choose from on your files. Very continent to have someone else store all the data. No need to be concerned about the vast amount of data due to computer failure or crashes. Cons: I would like to see some tutorials available for different tasks. The customer service is good, would like to see if it would be available for users to contact help other than through email only. Overall: After taking over the duties of Secretary for my Organization at the end of 2018 I have found that it is well worth the cost for the services provided. Even though the only customer service is through email they do a good job of solving the situations and questions. Cons: Not much. I guess so many options can be confusing but that is MemberTies strength! Overall: We directly increased out communication with out members using the email capabilities. We increased our revenue with regular billing and payment processing. The management reports let us know where we stand at all times. Thank you for your feedback! You're right that it's hard to have lots of flexibility and power without a bit of a learning curve IF you need to do one of the more complex things (like creating custom reports for example). Pros: Our 400 man senior golf group is very mobile (it's like herding cats). By using MemberTies, we're able to stay abreast of all of the changes. Cons: None, for a senior citizen to be able to negotiate the program is the best feature. Overall: We lose 20% of our base year over year and pick up another 20% new members. MemberTies makes it a simple task to keep up. Simplicity is the best. Pros: I like using the program. Nice & orderly. Technical support excellent. Ease of use. Thanks for your feedback. Please let us know what system (canned) reports you'd like to see. Sometimes it's hard for us to guess what a user might want to see in a report, so suggestions are always welcome! I'm not sure what you mean by a "tab for entering new dates". Please let support know about features you'd like to see and we'll get them on the list. Pros: Great way to track club memberships, enter dues and print label lists. Cons: Almost too many options and not enough instructions in "Help." I've never been able to successfully use built in email feature. Overall: Memberties has been a very reliable program for the past 10 years that we've used it. What few "hiccups" that happened due to me or software were quickly taken care of by the support group. Thanks for your feedback! Email can be a little tricky to set up, but if you have one of the more common email accounts (gmail, yahoo, etc) you should be able to create a profile that mimics the same settings. Contact support if we can help! Pros: This software is just what my organizations needed. The multitude of reports provides me all the information to successfully run my groups. Cons: There are no cons for this software. I would hope that at some point, the option of sending individual dues notices via email to the individual members might be something in the future. Thanks for your feedback. The ability to send reports via email rather than printing is definitely something we plan to build in to the new version. It just isn't really feasable in the current software. Pros: It works. Every time I have had a question it was answered almost immediately. Cons: It won't address envelopes or postcards. We are a private club and have no paid employees. Regarding envelopes, that's a shortcoming of reports that we plan to address in the next major release. The current workaround is to use the Document tool, which does have support for various formats, so you can generate them that way. Otherwise, the only option is generating mailing labels or a user-defined post card report with just addresses. Pros: It is steady and without failures. The templates are thorough and comprehensive. Cons: Excessively complicated for all but basic functions. Documentation is byzantine and difficult to search effectively. Overall: It has given us a strong, reliable method of documenting our membership, but it has inhibited us from adapting to modernized functionality, such as communication by group emails. Thanks for your feedback. If we can improve the documentation, please let us know. We provide standard Windows html help as a website, and also as a help file within the program, which should be pretty standard. You also can press F1 on any window to be taken straight to the help related to that window, which should simplify searching. Overall: I have been the admin of a non profit organization using your database, it is been very very helpful helping me managing our 500-600 members. I have used your support on a couple occasions and to my surprise I got a live person to talk to even after hours. Pros: This is the best overall use and price of anything I have looked at. Cons: I haven't found any thing I like least for what I do. Overall: I even recommended it to my church as it was more in line with their budget. I couldn't believe how easy it was to use. I don't use all the features but it serves all the needs. I would recommend to anyone who needs a program like this. Pros: The fact that it is open and completely configurable by the user. Cons: Cant think of any. Installed it in another Club about 7 years ago and then on joining this club convinced them to install it here. Thanks for your feedback... but I don't understand the comment about a lack of a grachical user interface. All MemberTies has ever been IS a windows graphical user interface. We've never provided a console or text based application. Pros: Ability to track members and obtain needed information quickly. Cons: Search queries can be challenging at times. Overall: For the price and functionality it cannot be beat! Thanks for your feedback. The advanced search is very powerful and I sympathize with the fact that it is possible to get a bit lost in it. If we can be of any help, feel free to contact support when you're stuck or not getting the expected results.